Teeth that are chipped, discolored, uneven, stained, or worn out might require veneers to renovate and restore your smile. Customized veneers are cemented directly onto the front of the tooth. Thy are strong and will result in a natural appearance that covers up any irregularities and restores the patients smile! Veneers are not an ideal choice for patients with severe tooth decay, have advanced gum diseases, or suffer from severe teeth misalignment. In cases where veneers are not recommended, traditional orthodontic treatments and crowns may be advisable. LUMINEERS – the painless way to bring out the beautiful, healthy, natural, permanently white smile in you! Ultra-thin LUMINEERS are custom designed to give you the beautiful smile you’ve always thought about having. Unlike traditional veneers, there are no shots, no drilling, and absolutely no pain. The process is completely reversible, so you have nothing to worry about and only a beautiful smile to gain! The great thing is, LUMINEERS are proven to last for over 20 years. Now you can have a renewed confidence in your smile that will last years! In addition to LUMINEERS, you can ask your dentist about LUMINEERS with LUMINATE in LUMITray Technology. It is a new technology that allows your dentist to place your veneers on all at once. The traditional way has them placed on one-by-one. Plus it offers an exclusive digital design and preview technology, which means you will know how your smile looks sooner and can spend less time at the dentists office! Whether you transform your smile with LUMINEERS or LUMINEERS with LUMINATE in new LUMITray Technology, it will take only 2 quick and easy visits to our office to rejuvenate your beautiful smile! During your first visit a custom, precision mold will be created. You and your dentist will also choose the correct shade for your new smile. On your second visit, your custom designed LUMINEERS are checked for a proper fit and to make sure the shade is correct. Once the final touch ups and revisions are made, they will be painlessly placed on your teeth! It really is that simple. A healthy and refreshed smile in as little as 2 visits! Teeth are stained and misshapen with unsightly spaces between them. An impression is made and the mold is sent to the Cerinate Smile Design Studios where only LUMINEERS are crafted. On next dental visit, the dentist checks the LUMINEERS to make sure they fit and look exactly how you would like them to be. Teeth are moderately etched to prepare the surface of the tooth for placement, but there is no removal of any sensitive tooth structure. This is transverse to traditional veneers, where it can be more painful because of the removal of sensitive parts of the tooth. 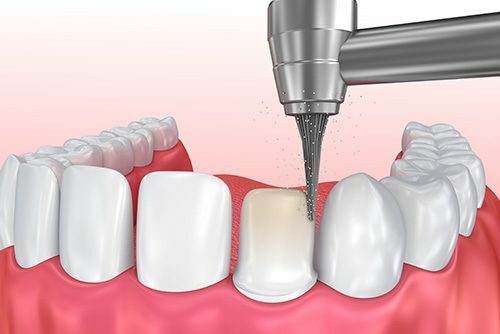 The LUMINEERS are then bonded to your teeth and set in place with a curing light to have the adhesive harden. In only 2 simple visits to the dentist, you will have a long lasting and whiter smile than ever before without shots, drilling, or pain! Teeth might appear stained and misshapen. An impression of the affected teeth is made and sent to a lab to fabricate the veneers. Anesthetic shots are given to numb the affected areas. Teeth are then shaved away with a drill to accommodate the new veneers. A much better smile is created, but unlike LUMINEERS the procedure is not reversible because the original tooth surface has been shaved down. This might cause your patient pain and discomfort immediately after the procedure, but the restored smile is completely worth the procedure!